Last week, Fat X Project code named Cake and Ice Cream came to a close. 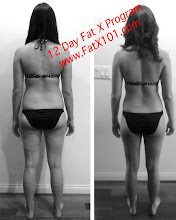 I put her through the 12 day fat burning Fat X Program (12 workouts, 12 days on the Fat X Diet) and these are her final results. Does the Fat X Program work for women? Well, once again I proved that the my fat burning program works for both women and men. As you can see she knocked off a layer or two of body fat in the 12 days, but even more importantly, her metabolism is now prepped for more fat loss a.k.a fat burning results in the future. Her fitness level is also a lot better and she will be able to use that increase in fitness to pursue her future goals. 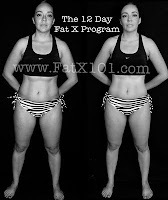 Looking back on this particular fat burning Fat X Project, there's a few things that could have been done better, and also a few things that Erika did really well that can help you. Erika showed up every day with a positive attitude and willing to work hard. She didn't wine and or complain during the workouts. She followed the rep ranges, rest, and work periods as specified in the program. Of course I personally coached her through each workout, but there was no interruptions or unnecessary rest or stalling when I said go. Now with all that being said, there was a couple of things that could have been better. She failed to keep and updated food log. Without a food log, there's no way to know exactly what she ate, and I couldn't make written suggestions of what to add and or subtract to her diet. 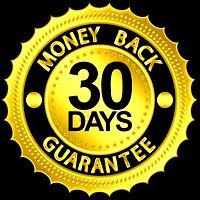 In my private training and coaching experience, clients that keep a food log increase thier results by 10-20%. Her strength was also a limiting factor. She was new to weight training. Some of the weights I had her use were too light, but the heavier choices were too much. This is normal through a first run throughout the Fat X Program. Some of the exercises where a bit easy and she flew through some of the circuits. Her improved fitness and strength will allow her to use heavier weights in the future, which will increase the intensity of the workouts. Using the heaviest weight possible is something that I constantly and consistently advocate. More weight, equals more energy required to move it. More energy used, means more calories are being burned, and it also means you stimulate your metabolic processes maximally creating the after burn effect. If you're in the Los Angeles or Pasadena area, feel free to contact me for private training/coaching coachrollie@gmail.com or you can also download the complete Fat X Program including the videos and workout manual/guide.